Dear Radio Friend, This week's show features stories from Radio Deutsche-Welle, Spanish National Radio, Radio Havana Cuba, and NHK Japanhttp://www.outfarpress.com/swr190301.mp3 From GERMANY- Two weeks ago a Pakistani terrorist group claimed responsibility for the deaths of 20 Indian soldiers in Kashmir. This week the Indian military bombed what they said was a terrorist camp in Pakistan, and the Pakistan military replied by shooting down 2 Indian jets. Read more about The Shortwave Report 03/01/19 Listen Globally! On the 25th of February, hundreds of activists from the Sunrise Movement occupied Senate Majority Leader Mitch McConnell's office. 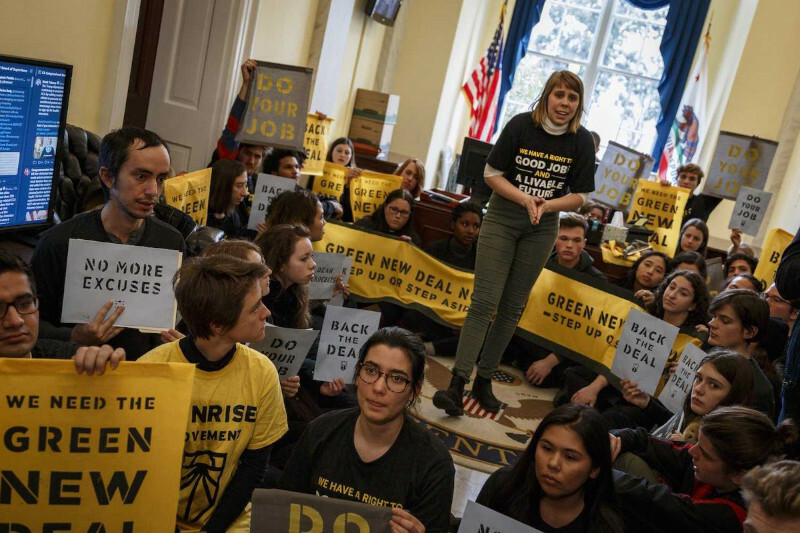 They were protesting his efforts to scuttle the Green New Deal with a quick (presumably NO) vote before it can even be fully written. Protesters called him out for "lining your pockets while we die in floods." Over 40 of them were arrested after refusing orders to roll up their signs and leave. 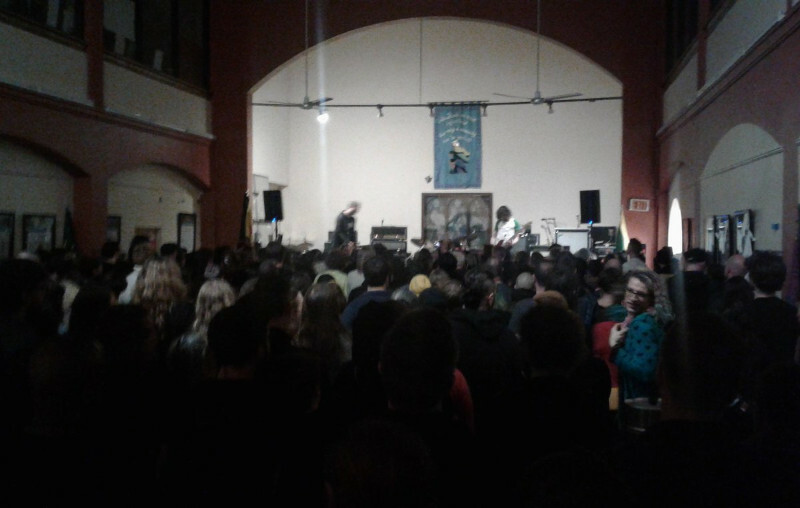 On the evening of the 23ed of February, several punk bands with Anti-Flag headlining played a Rojava(Kurdish) benefit show at St Stephens. The show was entirely sold out. At several times, anti-Fascist and pro-YPG/YPJ chants alternated with the music. A film from the war front against Daesh and Turkey was shown, and several speakers were invited to the stage as well as the bands. 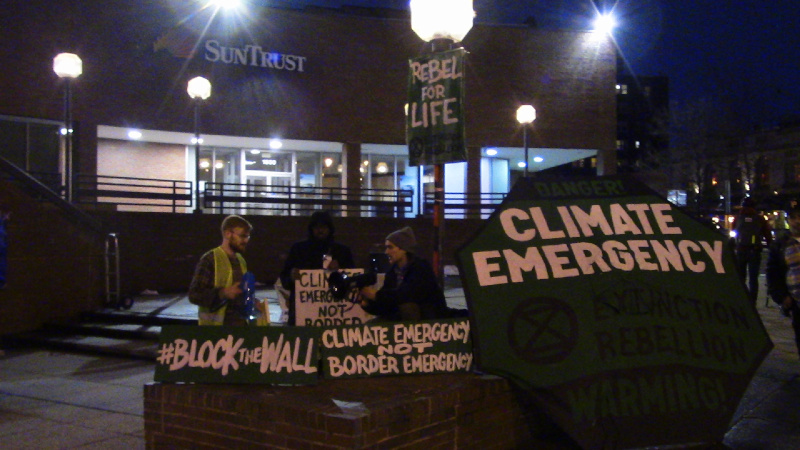 On Friday, the 22nd of February, DC's Extinction Rebellion chapter held their second "Freaky Fridays" protest about extreme climate chaos and resulting extinctions in a row. This time around, the chosen site was Suntrust Plaza at the intersection of 18th st and Columbia Road. This was picked both to call out Suntrust for their role in funding fossil fuels and because the area is very busy on a Friday night. Dear Radio Friend, This week's show features stories from NHK Japan, Radio Deutsche-Welle, Sputnik Radio, and Radio Havana Cuba.http://www.outfarpress.com/swr190222.mp3 From JAPAN- Japanese Prime Minister declines to comment on whether he nominated Donald Trump for the Nobel Peace Prize. Honda Motors will shut down its plant in Swindon England due in part to uncertainties around Brexit. Read more about The Shortwave Report 02/22/19 Listen Globally! At Noon on the 18th of February, protesters at the White House declared that TRUMP is the "national emergency". This is over his attempt to claim dictatorial powers to remove as many Brown people from the US as possible and build his wall. 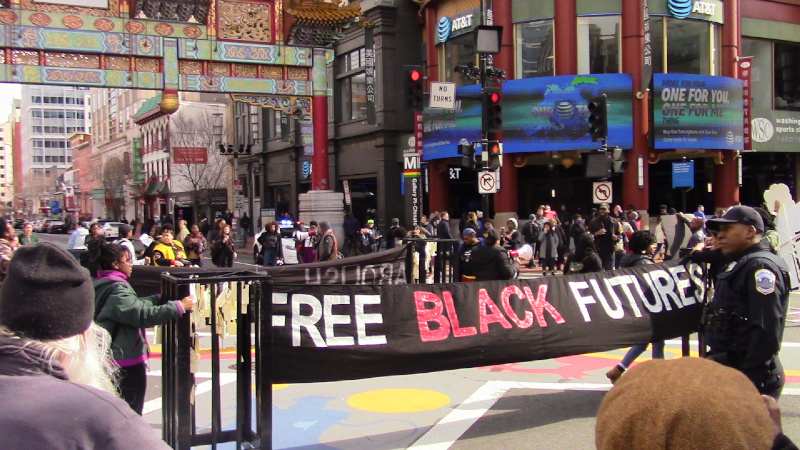 At the exact same time, Black Lives Matter blockaded Chinatown, protesting MPD and Bowser for their efforts to remove as many Black people from DC as possible. Protesters and mock prison cells exclude car traffic from prime shopping territory in Chinatown. 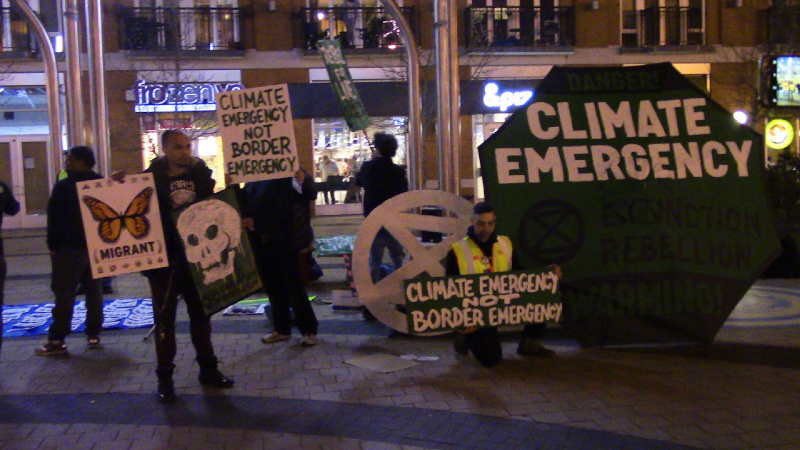 On the 15th of Feb, the DC chapter of the global Extinction Rebellion movement held a "Jeopardy" themed street theater event in Columbia Heights. Questions included "a form of government made more common by climate change and resulting migration" for which the answer of course was "what is Fascism?" Recently, BLM activists and No Justice No Pride got word that inmates at both the DC Jail (Central Detention Facitly) and the so-called "Correctional Treatment Facility" had used various excuses to deny inmates ALL outdoor recreation time for the past 8 months. 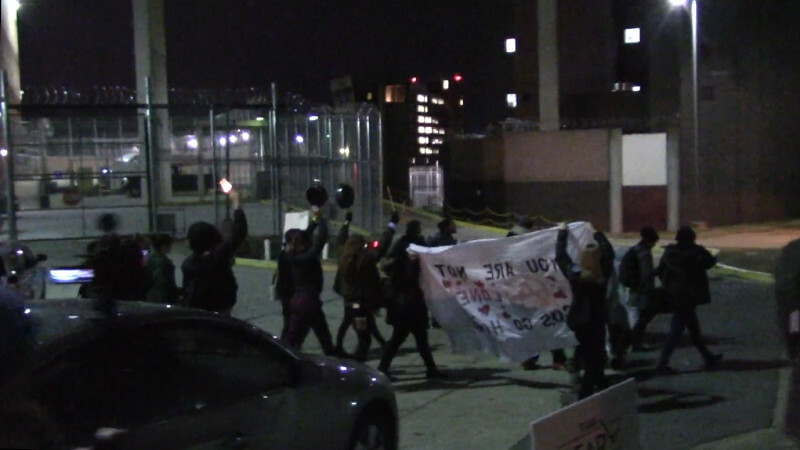 In reponse, activists staged a pot-and-pan banging noise protest outside the jail on the evening of Valentine's Day. On the 12th of Feb, migrants holding Temporary Protected Status backed by a massive crowd of supporters marched from the White House to Capitol Hill to demand legal permanent residency. 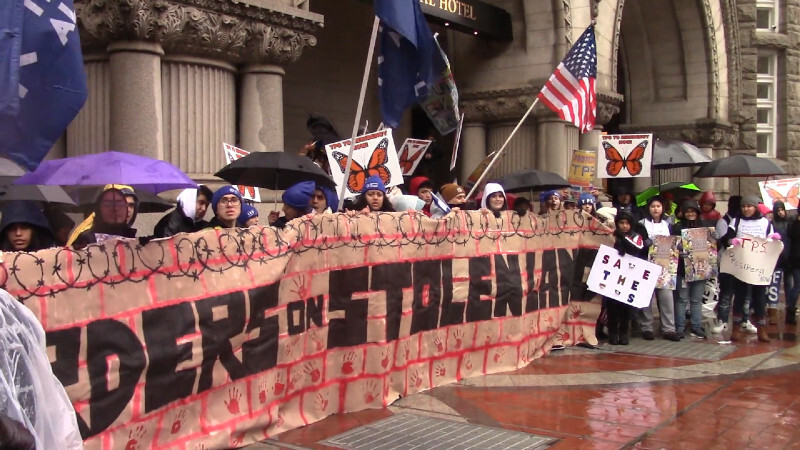 The march stopped at Trump Hotel, where a mock wall banner emblazoned "No Borders on Stolen Land" was set up, then torn to pieces in symbolic demolition of Trump's wall. Diez horas con la globalizacion-El Individuo Nación Oscar Sánchez Fernández de la Vega Creer que nuestra identidad nos la puede proporcionar un territorio, un idioma, nuestras tradiciones y mucho menos una bandera, un himno o una patria es simplificar lo complejo. Con seguridad nuestra “individualidad” está potencialmente en nosotros mismos y todos los derechos deberían de orientarse a que se desarrollase total y libremente.